When you decide that you want to add sound to your storyboard, you must first prepare the sound outside of Storyboard Pro. 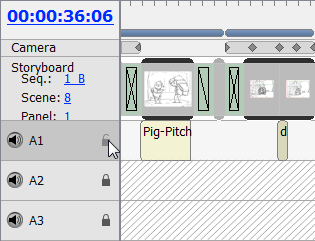 To work with sounds in Storyboard Pro, add one or more audio tracks into which you import the sound sequences. You can then organize the sounds by organizing audio tracks, mixing sound levels, and editing the part of the sound sequence you will use. To import sounds and view audio tracks, display the Timeline workspace. You can mute all or some of the audio tracks in your project. ‣ In the Playback toolbar, click the Sound button to enable audio playback. In the selected audio track, click the Sound On/Off button to turn that track’s sound on or off. When all audio tracks are enabled, you can quickly isolate one audio track by muting all the others at once. ‣ When all audio tracks are enabled. Click the Sound button on the one audio track you want to leave on while holding down the [Alt] key. All other audio tracks will be muted. Click again while holding the [Alt] key to turn them all back on. By default, an audio track follows the timing changes made to your project. 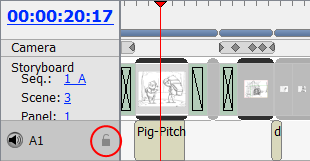 This means that if you extend the duration of a panel, the audio track following this panel will move in consequently. However, you can lock an audio track to prevent it from following the timing change. Locking a track will also prevent you from making unwanted changes to the audio timing. Once it is locked, it is impossible to drag and modify the audio clips or import more sound into this track. 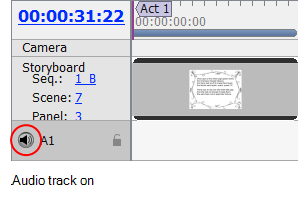 ‣ In the Timeline view, click the open lock icon of the audio track you want to lock. The open lock icon will change to a closed lock icon and the audio track is locked. ‣ In the Timeline view, click the locked icon of the audio track you want to unlock. The locked icon changes to an open lock icon and the audio track is unlocked. When your project's audio tracks are all unlocked, you can lock them all at the same time using the Lock All Audio Tracks command. In the Timeline view, make sure that all audio tracks are unlocked, or else, the Lock All Audio Tracks command will be unavailable. 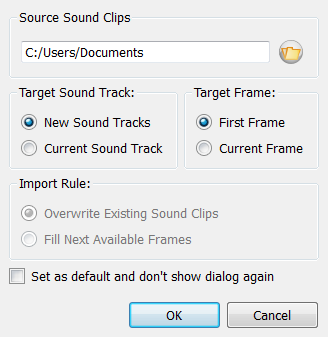 Select Sound > Lock All Audio Tracks. NOTE: If an audio track is already locked, the Lock All Audio Tracks command will toggle to Unlock All Audio Tracks. In the Timeline view, make sure there is at least one locked audio track. Otherwise, the Unlock All Audio Tracks command will be unavailable. Select Sound > Unlock All Audio Tracks. When all audio tracks are unlocked, you can quickly decide to lock all but one. 1. In the Timeline view, hold [Alt] and click the open lock icon of the audio track you want to remain unlocked. All other audio tracks are locked. Click once more on the audio track's open lock icon while holding the [Alt] key to unlock all audio tracks. You can delete an audio track at any time. When you do so, all the sounds in the audio track are also deleted. You must work in the Timeline view. ‣ Select Sound > Delete Current Audio Track. ‣ Right-click the audio track and selectDelete Current Audio Track. ‣ In the Sound toolbar, click the Delete Current Audio Track button. The selected audio track is deleted from the Timeline view. By using a series of keyboard shortcuts, it is possible to select a sound clip and all the sound clips following it at once. These options are also available on panels—see Changing the Panel Duration. 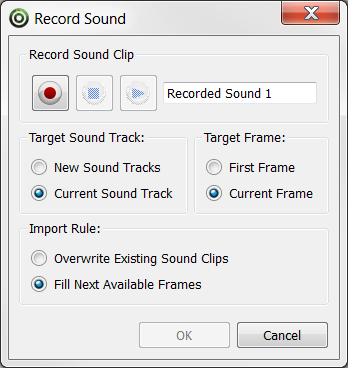 Once you have created audio tracks, you can now import sound clips. Sound clips are edited bits of sound which are already edited and in digital format, ready for import. These are the different features that will help make things clear while working with sound. ‣ At the bottom of the Timeline view, click the Menu button and select Show Waveform. ‣ From the top menu, select Sound > Show Waveform or right-click in the audio track area of the Timeline view and select Show Waveform. ‣ In the Sound toolbar’s extra buttons, click the Show Waveform button. From the top menu, select Sound > Show Waveform. This option must be set first. ‣ In the Timeline view, right-click in the audio track area of the Timeline view and select Show Volume. ‣ In the Sound toolbar’s extra buttons, click the Show Volume Envelope button. A blue line, indicating the sound level, is displayed for each sound sequence. White squares mark the points at which the sound changes to a new level. 2. Hold down the [Alt] key and click the line to add a new marker. 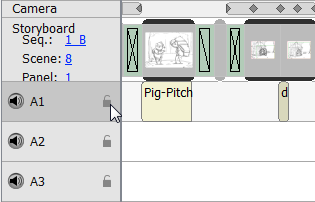 A plus sign (+) on the cursor indicates that a keyframe will be added. You can add an unlimited number of volume keyframes. 3. Drag an existing marker to adjust the volume at a specific frame. When you drag a volume keyframe, a box appears displaying the current dB level. Hold [Alt] and click an existing volume keyframe to delete it. A minus sign (-) on the cursor indicates that the marker will be deleted. With Sound Scrubbing, your sound will play forward or backwards as you scrub through the Timeline view. ‣ At the bottom of the Timeline view, click the Sound Scrubbing button. ‣ From the top menu, select Sound > Sound Scrubbing. ‣ In the Timeline view, right-click and select Sound Scrubbing. ‣ In the Sound toolbar’s extra buttons, click the Sound Scrubbing button. Verify that sound is enabled and that the audio track you want to work with is not muted. You may find it easier to edit sound when the waveform is visible. ‣ Click on the starting edge of your clip and drag the cursor right to shorten your clip at the desired timing. This cuts the beginning of the original file from playback. ‣ Click the ending edge of the clip and drag left to shorten the clip at the desired timing. This cuts the end of the original file from playback. You can move multiple sound clips from the same audio track or different audio tracks at the same time. In the Timeline view, draw a selection across the clips you want to select. 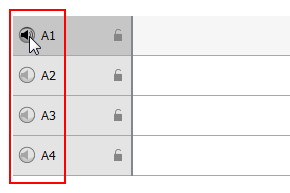 You can also [Shift] + click to create a contiguous multiple selection or [Ctrl] + click (Windows) or [⌘] + click (Mac OS X) to create a non-contiguous selection.